I managed to spend some time this morning playing with the new VMware Server 2 beta. 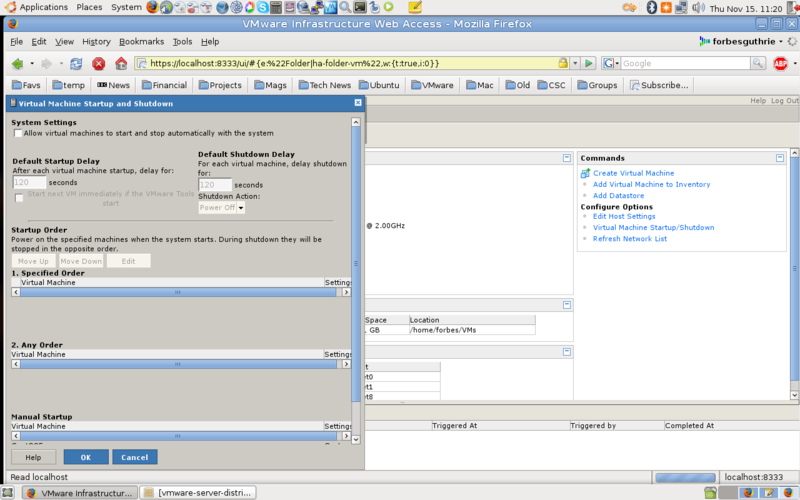 When prompted, run the vmware-config.pl script. The default answers should suffice for most set-ups. 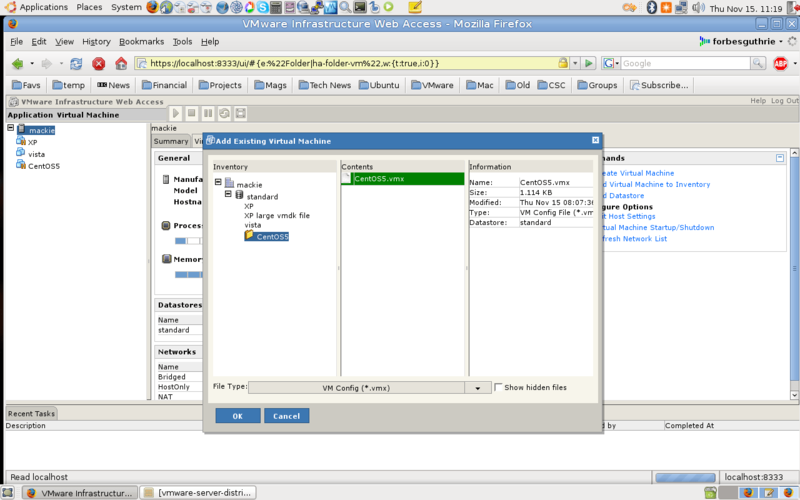 I already had some VMs in my home folder, so I changed the default location for the datastore. I then had to reboot my laptop, as a “vmware-mgmt restart” still wouldn’t allow the web interface to start. There was no menu items added, but opening a browser to https://localhost:8333 allows you log into the Web Interface. The Web Access is obviously the way that VMware are pushing for their Server product. This allows a smoother upgrade to VI3, and makes Server more like a baby ESX, rather than a free Workstation. I can understand why they want to do this, but it highlights a missing piece of the puzzle – there is still no VI Client for Linux/Mac users. 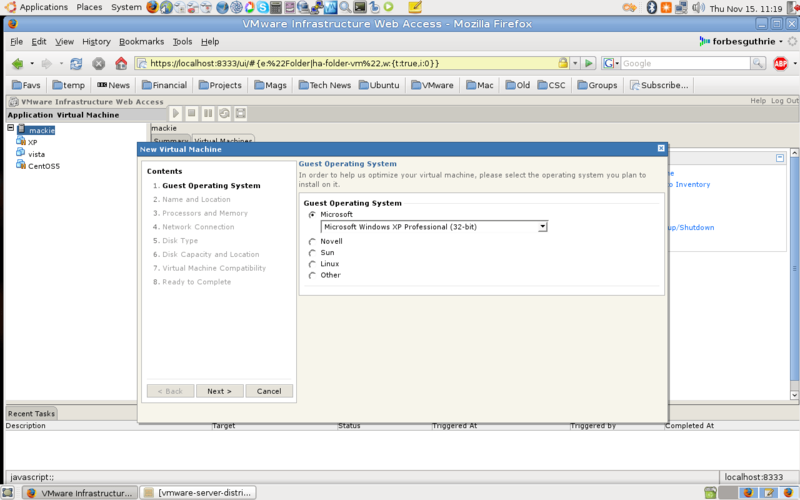 I’ve never understood the reason for VMware creating its VI Client as a Windows only .net application. The old Server console (and Workstation) is based on a native console (GTK based? ), which works very well in Windows and Linux. So rather than begging VMware to re-instate the old native console for this, I would rather see then drop the existing VI Client and re-write this as a cross platform client. Ok I didn’t use above guide to install vmware server 2 on my linux, I came here after installation because I’m stuck with installation of guest system (winxp). First a comment, with the new RC1 build of the server the standard port is 443 instead of 8333. Now a question, I dont know how to access a guest system window, where do I get the guest system window? I’m confused? its been a while since I played with this, so I had to hunt around a bit. Edit the install.rdf file in the unzipped output, and change the compatibility (there’s a field that says 3.0.0., you should change that to 3.0. – or 3.0.1. *).